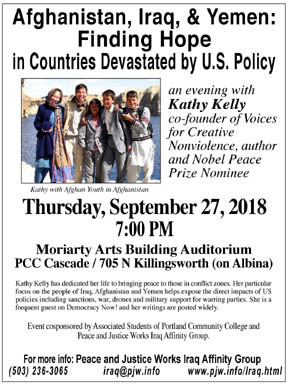 Join author and Nobel Peace Prize Nominee Kathy Kelly, co-founder of Voices for Creative Nonviolence, for an evening of insight and inspiration on Thursday, September 27 at 7 PM. Kathy's talk is titled "Afghanistan, Iraq, & Yemen: Finding Hope in Countries Devastated by U.S. Policy." The event will be held at the Moriarty Arts Building Auditorium at Portland Community College Cascade, 705 N Killingsworth (on Albina). It is accessible by bus lines 4, 44 and 72. Kathy Kelly has dedicated her life to bringing peace to those in conflict zones. Her particular focus on the people of Iraq, Afghanistan and Yemen helps expose the direct impacts of US policies including sanctions, war, drones and military support for warring parties. She is a frequent guest on Democracy Now! and her writings are posted widely. Ms. Kelly's visit comes just 10 days before the 17th anniversary of the start of the US war in Afghanistan, which is said to be this country's longest war. It also comes about two months after Saudi Arabia used a US bomb to kill a school bus full of children in Yemen, making Kathy's message all the more urgent. This event is free and open to the public. The venue is reachable by TriMet bus lines 4, 44 and 72. Cosponsored by Associated Students of Portland Community College (Cascade) and Peace and Justice Works Iraq Affinity Group. Other sponsors include KBOO Community Radio, Network Against Racism and Islamophobia, Veterans for Peace Chapter 72, Oregon Physicians for Social Responsibility, Portland Peaceful Response Coalition, Jewish Voice for Peace-Portland, Women's International League for Peace and Freedom-Portland and the PCC Internationalization Initiative. at (503) 236-3065 or iraq@pjw.info . Ms. Kelly will also be speaking at the University of Portland at 5:30 PM on Wednesday, September 26 (doors open at 5 PM) in a talk titled "Of Intervention, Immigration & the U.S."